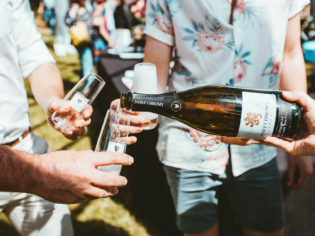 Only in its fifth year, Effervescence festival in Tasmania’s Tamar Valley is taking the Australian – and global – sparkling wine industry by storm. Disclaimer: I’m no wine expert. In fact, my preference for red largely stems from a deep-seated fear of reliving my university days and that unforgiving taste of cask wine chardonnay. The sophisticated knowledge I once possessed growing up on a small Victorian vineyard was poured down the drain – metaphorically speaking – when I moved out of home, and financial independence in the city quickly gave me a taste for the ten dollar varieties you’d find at your local Dan Murphy’s. Sorry Dad. I was grappling to conjure this long-lost knowledge (was it de-stemmed or was it whole bunch fermentation?) when I flew down to Tasmania’s fifth annual Effervescence festival – a small, but rapidly growing festival aimed at celebrating Tasmanian sparkling. Yes, you heard correctly – Tasmanian sparkling. Forty years ago such a statement was laughed at by wine drinkers, winemakers and the government alike; scientific ‘proof’ and popular opinion deemed Tasmania far too cool a climate to produce any bubbles worth drinking. Skip forward a couple of decades, and Andrew Pirie’s debut 1996 Pirie was dubbed by Matthew Jukes – one of the UK’s most influential wine columnists – as “the greatest sparkling wine ever made outside of Champagne.” In 2016, a Northern Tasmanian House of Arras sparkling won Best Wine in Show at three capital city wine shows, breaking history as the first sparkling to trump every still wine in the country. Now, at almost $3000 per tonne, Tasmanian grapes are of the highest value in Australia, far surpassing those of the Yarra or Barossa. It can hardly be called surprising then that every year, hundreds of Australians flock to Northern Tasmania for a taste of what wine critics say is Champagne’s biggest contender. When I arrive at Josef Chromy Wines (an easy 15-minute drive from Launceston) the first thing I notice is the view. Rolling hills of perfectly manicured vines descend towards a large open lake, where fountains sprinkle the water and a classic white bandstand is perfectly set with white tablecloths. The sunshine has a certain November sting to it and the grass – greener than any I’d find in Sydney – is so spongy it’s hard to resist the temptation to kick my shoes off and run down the hill. I manage to keep my shoes on and head towards the Grand Tasting area, where representatives from the region’s best wineries are enthusiastically pouring bubbles underneath a marquee. Sun loungers are spilling out onto the lawns on bean bags, already enjoying a glass or two even though it’s barely past eleven. This is definitely my kind of place. A festival that started from fairly humble beginnings, Effervescence is all about the region’s top wine producers gathering together, as allies, to share their knowledge with one another and to offer visitors (and locals) a taste of what truly is world-class sparkling. Despite the growing crowd, it’s definitely maintained this vibe. My morning masterclass with husband-and-wife duo Shane Holloway and Fran Austin of Delamere Vineyard (shared only with 12 others) is full of laughs and of course, plenty of bubbles. I leave feeling like I can confidently tackle any question thrown at me on the topic of house non-vintage styles or Méthode Traditionelle. And this is what the festival is all about. Winemakers both teach and learn from each other – gathering to discuss their latest experimental techniques and to chat all things wine with themselves and punters on a friendly, down-to-earth level. Their enthusiasm is contagious; they are so excited by sparkling, you can’t help but get excited about it. Now if you’re truly serious about the wine – as many festival attendees certainly are – head to the ‘Tasmania vs The World’ international tasting. Here you’ll find a panel of wine professionals including International Wine and Spirit Communicator of the Year 2015 Tyson Stelzer chaperoning an earnest crowd through the world’s best sparkling regions, flight by flight. The session reaches a crescendo with the final flight, a blind tasting: two premium French Champagnes against two of Tasmania’s finest. This year, the crowd favourite was revealed (to the horror of some) as a French Champagne – topping last year’s stand-out winner – a Tasmanian House of Arras 2003 Late Disgorged. There’s always next year, conceded the panel – championing the same impassioned enthusiasm I had seen all weekend. And you’re not just there to learn. If you’re on the mailing list and lucky enough to snag a ticket, head along on opening night to what’s known as ‘The Grand Degustation’ – which is exactly what it sounds like. Dressed in strictly black tie, sit on a table with your own hosting Tasmanian winemaker as they take you through their paired wines, course by course. Not quick enough to secure a ticket to this event, I headed to Timbre Kitchen, chef Matt Adams’ relaxed, breezy alternative. It was here I spent the next five hours, drowning in delicate gourmet food and (almost) too much wine, as French oenologist Loic le Calvez talked us through his favourites. I spent the following morning – feeling as fresh as one might after an evening of drinking – enjoying a sparkling brunch on the lawns of Clover Hill vineyard, overlooking the resplendent Tamar Valley. And I can still taste that Clover Hill cuvée. Grand Degustation dinner: for tickets, ensure you are on the mailing list of the participating wineries to be notified when tickets become available. Alternatively you can be added to the wait-list by emailing info@effervescencetasmania.com. For all other event tickets, head to effervescencetasmania.com.